17% fail due to contamination entering the bearing. This is a most troublesome factor because contaminants are everywhere. 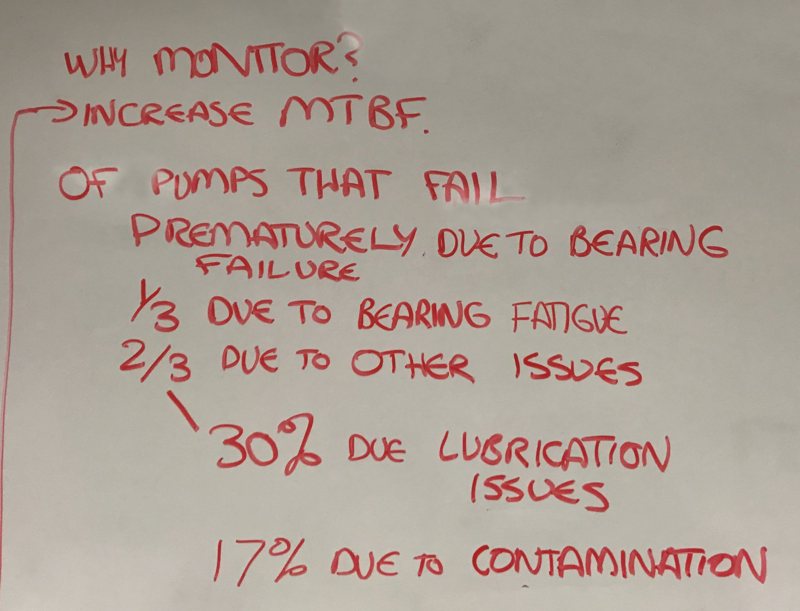 Monitoring pumps with oil analysis is an accepted method for improving the MTBF of the pump. The resistance of a fluid to flow under gravity. Viscosity is the most important lubricant physical property for pumps. The viscosities of lubricants vary depending on their classification or grade, as well as the degree of oxidation and contamination in service. Oil viscosity is expected to rise over time and use, and loss of viscosity is considered to be more serious than an increase. For rotary screw systems where the oil is mixed with lubricant and then separated, the viscosity must be taken after the separator, otherwise the air or gas will affect the result. Viscosity is routinely measured right after an oil change to confirm the right oil was added, as well as on a periodic basis. New technologies make it easy to measure kinematic viscosity- solvent free, low volume systems are available that combine ease of use with data logging ability. Water is the most common liquid contaminant in pumps worldwide, and always needs to be monitored. Excessive water in a system destroys a lubricant's ability to separate opposing moving parts, allowing severe wear to occur with resulting high frictional heat. Water contamination should not exceed 0.25 % for most equipment, though centrifugal pumps used in power plants specify much tighter limits such as 500 ppm for boiler feed pump bearings. A number of new technologies exist to detect water contamination in lube oils, and on-site results correlate extremely well with laboratory techniques. Particle counting measures the cleanliness of a fluid, and is a critical test for centrifugal pumps, where sleeve bearing or rolling element bearings are being monitored. 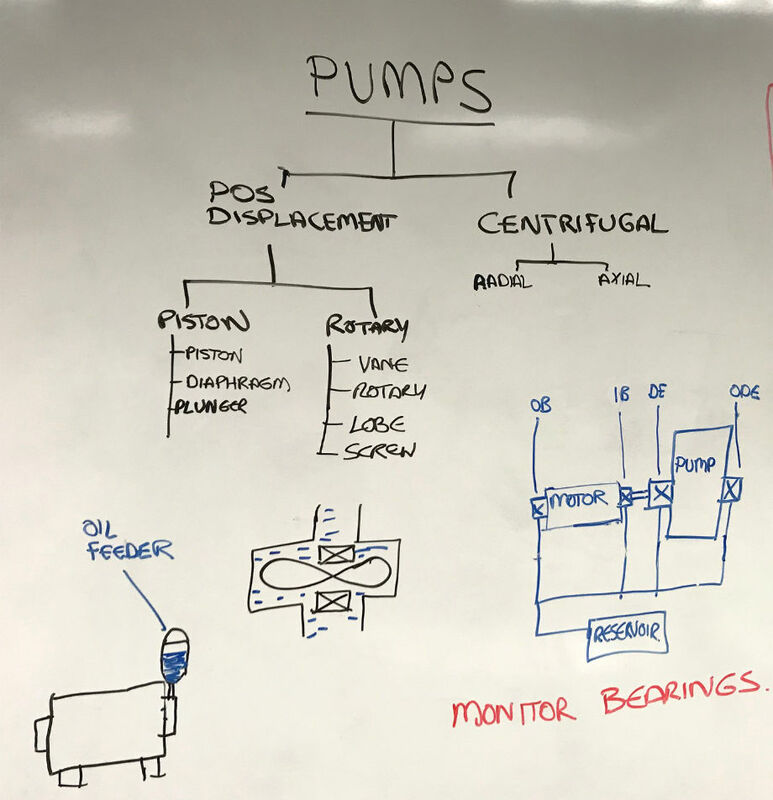 For positive displacement pumps it helps to determine if ingression or wear is occurring on other moving parts in addition to bearings. Gear and vane pumps have very tight tolerances, and are susceptible to jamming if the oil isn't filtered properly. When particle counts are elevated, it is important to understand the cause. Newer technologies such as LaserNet Fines not only count particles and report to ISO 4406 or SAE AS 4059, they also provide more detail about particle morphology to help the user understand where the particles are coming from. Particle imaging enables maintenance teams to immediately see sand/dirt particles and also the level of ferrous debris that is contributing to the count. This level of detail enables smarter work orders to be developed, focusing on eliminating the root cause of the particle. Refers to a titration method designed to indicate the relative acidity in a lubricant. When the TAN value reaches a predetermined level for a given lubricant and application it is often time to change the oil. An abrupt rise in TAN indicates an abnormal operating condition (e.g. overheating) that requires investigation. Elemental spectroscopy is atechnique for detecting and quantifying elements in a used oil resulting from wear, contamination and additives. The oil sample is energized to make each element emit or absorb a quantifiable amount of energy, which indicates the elements concentration in the oil. The results reflect the concentration of all dissolved metals (from additive packages) and particulates. This test is the backbone for all on-site and off-site oil analysis, as it provides information on machine, contamination and wear condition relatively quickly and accurately. For pumps, bearing wear from nonferrous roller components can be detected using elemental spectroscopy. Infrared Spectroscopy is a great technique for detecting organic contaminants, water and oil degradation products in a used oil sample. These are detected by analyzing the infrared spectrum of a used oil and searching for absorbtion at specific peaks that correspond to the presence of various components. The concentration of these components is proportional to the amount of light absorbed at the wavelenght of interest. Oxidation is a measure of the degradation byproducts in the oil. If oxidation becomes severe, the lubricant will corrode critical pump surfaces, and also deposit silt or lacquer at servo valves. The greater the "oxidation number", the more oxidation is present.